Sabbath Walk: Before Your Shop.... Turn the T.A.P. TITLE: BEFORE YOU SHOP . . . TURN THE T.A.P. Shopping. For shopaholics, this is the time of the year to splurge. If one were to look into any shopping mall during this time, one will be hard-pressed to find evidence of a retail slump or an economic depression. There are sales galore and buying frenzy in many places. Why do we buy? What is the point of buying on impulse at a special sales? This week, I like to look at the way we shop, especially when we in the rich hemisphere already have our basic needs met. First there is Thanksgiving Thursday Shopping. Thanksgiving week has always been a crazy week. Down in the US, it is perhaps the busiest time of the year for families, for friends, and for retailers. With turkeys in high demand, prices rocket. Parking lots are full. Tempers flare easily amid the heavy human traffic. With the retail industry trying to maximize the holiday shopping, many staff work longer hours, and family time gets shortened as a result. In the rush to bring in the bucks, people are fast forgetting what Thanksgiving is all about. I spoke to a cashier at the Fred Meyer till on Thanksgiving week, commenting about how hard it is to get a parking space that day. She said, that it will be like this from November to the end of the year. Then, there is Black Friday, the day after Thanksgiving. Lines snake round the block outside big retailers like Walmart, Best Buy, Target, and others. This year, Black Friday shopping began early, 8pm on Thursday evening. Yes. You got it. Some workers at Walmart even protested at the management's decision to let business eat into their own family hours. Whether we blame it on the economy, or the aggressive stance by the competition next door, Black Friday has creeped into Thanksgiving Thursday. Already, there has been several Youtube videos on fights, swearings, and pandemonium as shoppers trample over one another for stuff offered at steep discounts. A popular tweet by a Tweeter named "Sarcasm" on the day leading up to Black Friday says it all. Third comes Cyber Monday. 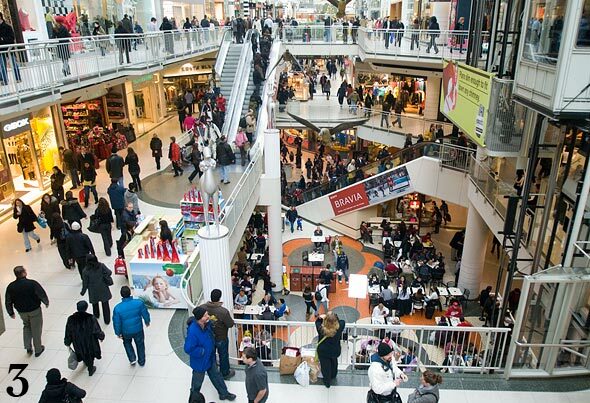 Retailers are going all out to rake in the profits, offering Black Friday like sales online. This online sales is a very attractive alternative for people who want to take advantage of big discounts, but refuse to join in the crazy crowds and long line ups. Finally, here comes the big one: Christmas. It makes me wonder when will it all stop. Toward the end of November, it will be all Christmas mood, food, and continuous shopping. It makes me wonder, why are people shopping so frantically during this time of the year? Are they in the spirit of giving and sharing? Are they genuinely in lack? Or are they simply chasing after the Joneses? B) What's After the Shopping Spree? Psychologists have said that the period after Christmas is also a time where many people enter into depression. From Thanksgiving to Christmas, people has one single goal. Shop till you drop. Shop for the best deals. Shop for all kinds of reasons. 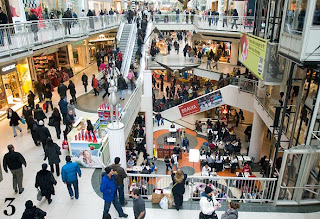 If an alien from outer space is to land on a typical North American shopping mall, it will probably ask: "Is people living to shop?" Is our culture encouraging us to live for the sake of shopping? Honestly, the evidence are all there. Turn on the TV or radio, you can watch or hear frequent commercials that are parading their latest wares at the craziest prices. Go onto the Internet and web advertisements come in the form of pop-ups, clever mouse-over flash views, or inserted links on webpages. Even our emails can be inundated with ads. I know. Some women swear by shopping. They even call it "retail therapy." It helps take the stress out of the long day working in the office. There is some satisfaction when one has managed to find the best deal. C) Is There More To Life Than Shopping? The answer is a no-brainer. Of course there is life. My point is, how are we showing it? Do we really need more stuff? What's with the crazy spiral of upgrading our electronics and toys? Does the price justify the purchase of a fourth flat screen TV? Do we have a way to be wise with our purchases, or with our refusal to consume non-stop? Several groups have started various initiatives against the crazy consumerism in the West. There is a "Buy Nothing Day" that advocates for a 24-hour hiatus on buying stuff. There is also "Buy Nothing Christmas." Their agenda is simple. Rebel against the consumeristic tendencies of our age, and to enable us to reflect on why we need to buy so much stuff? Even if we are to give stuff to people we know, are we buying them staff they already have? Or are we simply becoming pawns to the clever marketing and aggressive sales by the retailers. Honestly, retailers are becoming extremely creative with their marketing and sales. Just take the Apple iPad for example. Since the launch of the iconic tablet on April 3rd, 2010, there has been four generations of iPad in the span of 30 months! That means, my wife's iPad 1 is already obsolete nearly four times over. "Those who weep or who rejoice or who buy things should not be absorbed by their weeping or their joy or their possessions." We must not be absorbed by our worldly activities so much that we forget about our heavenly duties. This begins by not becoming too possessive of our earthly things. The NIV translates the Greek word "me katechontes" as "not theirs to keep," a clear reference to not becoming bogged down by things, but be lifted up to see the things above. Paul confirms this in 1 Corinthians 7:31 by saying that this world we know is passing away. Perhaps, the thinking behind the consumer is that they can buy happiness with things. If we approach life the way we shop and bargain for the best price, invariably, we let the consumerist tendency creep into Church. Heard of shopping for Church? Things cannot buy happiness. Yet, many people continue to buy into this deceptive practice. They turn the wants into needs. They turn wants into must-haves. In the pursuit of happiness, people forget that they hearts can never be filled by things or all kinds of stuff. Pascal reminds us again that we all have a God-shaped heart. This means that only God can satisfy. What about Christians who shop passionately? This one thing I know. If Christians passionate about shopping, can translate that shopping energy into living for God, there will be a spiritual revolution. What about the one who skip your Bible study class because of a special sale downtown? What if a certain sale grabs your attention, making you move from a want to a must-buy? Let me provide three brief tips. I call this "Turn the TAP." Tap: Is there a better investment of time? Alternative: Is there a better way to use that cash? If I can save 20% from buying, what am I saving that 20% for? Pray: Ask God if I really need it. Turn the TAP. Maybe, instead of counting our savings and get distracted about something to buy, why not consider how much we have already been blessed? Jesus comes to earth not to buy, shop, and queue up for the best bargains. He comes to earth to give, give, and give, that we all may live. As you count your blessings, you will make your life count, to be a blessing.